I've always struggled with 'problem' skin. As a teenager there were many tearful moments where I refused to come out of my room because my face had 'erupted'. As an adult, a hormone imbalance and PCOS meant that I still continued to suffer from acne and skin issues. It's no exaggeration when I say I've tried pretty much every brand in the skincare market - I'd get sucked in by each new release hoping to find the miracle product. High-street, luxury... it didn't matter to me, if it would solve my skin issues I didn't care how much it cost. So when I started to make the move to a more natural/low-tox lifestyle, I was concerned about removing all of my chemical-laden skincare products. Would natural ones work the same? Well, I can tell you... since using Essential Oils in my skincare, my skin has totally improved. Instead of wasting £1000's on every product under the sun, all I needed was a bottle of Frankincense... who knew?! Today I'm sharing my current, summer skincare routine. All of the products mentioned are non-toxic and instead are packed full of pure plant magic. Olive oil to hydrate the skin and keeps the skin looking soft and youthful. I sometimes add a drop of Grapefruit to my cleanser for extra purification, or if my skin looks a little dull. I use the Verage Moisturiser after I've cleansed. It's perfect for all skin types, and combines essential oils of Jasmine, Geranium, Sea Buckthorn Berry, and Juniper Berry with plant extracts for deep hydration. I add a drop of Franckincense to help reduce the appearance of fine lines and wrinkles, and since using this routine my complexion is smoother and clearer. For my eyes I currently use Origin's GinZing eye cream to brighten the dark circles I'm prone to. I have to be honest - whilst the majority of the ingredients are natural and organic, it does contain Polyethylene glycol (PEG) and a few other things I'm not happy about, so I think I will be swapping this out for a homemade eye cream using Essential Oils ( like this one). On an evening I love to use a cleansing oil to remove any makeup. I'm currently using Origin's Clean Energy Gentle Cleansing Oil. It contains Olive, Sunflower, Sesame, Safflower, Kukui Nut and Macadamia Oils along with Grapefruit, Lemon and Orange essential oils. I also add a drop of Tea Tree oil. I massage it in then use a clean face cloth to remove and rinse. 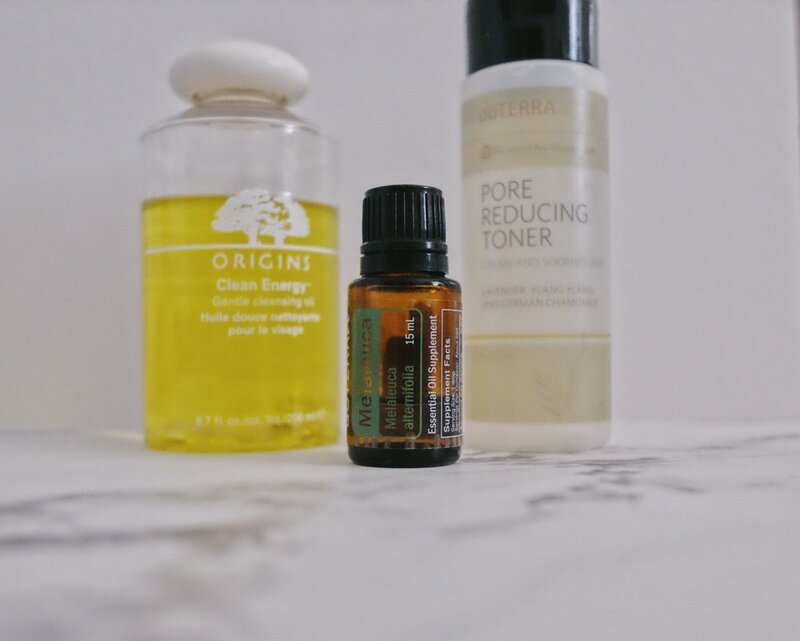 After my evening cleansing, I use doTERRA's Pore Reducing Toner to calm my skin and reduce the appearance of my pores. It smells amazing and contains Lavender, Ylang Ylang, and German Chamomile oils. I use my Verage moisturiser on an evening, again with a drop of Frankincense added. Twice a week I follow my evening skincare routine with doTERRA's Detoxifying Mud Mask. I am OBSESSED with this face mask. It feels like a super luxurious Spa treatment and it leaves my skin feeling silky soft. It's infused with Myrrh, Juniper Berry, and Grapefruit essential oils—known for their cleansing and smoothing benefits. So that's my current skincare routine and I can honestly say that I am so much happier with my skin, and confident knowing I've eliminated nasty chemicals. *If you'd like to try doTERRA skincare products and recieve a 25% discount, drop me an email and I'll get you set up with your membership account.